The group number is an identifier used to describe the column of the standard periodic table in which the element appears. Groups 1-2 termed s-block elements. Groups 1-2 (except hydrogen) and 13-18 are termed main group elements. Groups 3-12 are termed d-block elements. Groups 3-11 are termed transition elements. Transition elements are those whose atoms have an incomplete d-subshell or whose cations have an incomplete d-subshell. Groups 13-18 termed p-block elements. Main group elements in the first two rows of the table are called typical elements. The first row of the f-block elements are called lanthanoids (or, less desirably, lanthanides. The second row of the f -block elements are called actanoids (or, less desirably, actanides. In addition, groups may be idenitifed by the first element in each group - so the Group 16 set of elements is sometimes called the oxygen group. Image showing periodicity of group numbers for group 17 chemical elements. There is considerable confusion surrounding the Group labels. 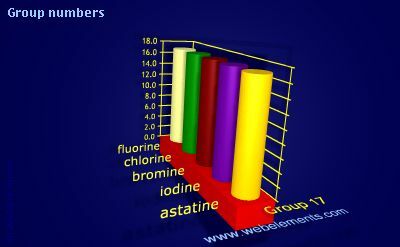 The scheme used in WebElements is numeric and is the current IUPAC convention. The other two systems are less desirable since they are confusing, but still in common usage. The designations A and B are completely arbitrary. The first of these (A left, B right) is based upon older IUPAC recommendations and frequently used in Europe. The last set (main group elements A, transition elements B) was in common use in America. International Union of Pure & Applied Chemistry: Commission on the Nomeclature of Inorganic Chemistry, Nomenclature of Inorganic Chemistry Recommendations 2005, Eds. N.G. Connelly, T. Damhus, R.M. Hartshorn, and A.T. Hutton, Royal Sociery of Chemistry, 2005. ISBN-13: 978-0854044382. W.C. Fernelius, and W.H. Powell, "Confusion in the periodic table of the elements", J. Chem. Ed., 1982, 59, 504-508. Periodic table in any volume of the Inorganic Oxford Chemistry Primers, Oxford University Press, Oxford, UK.